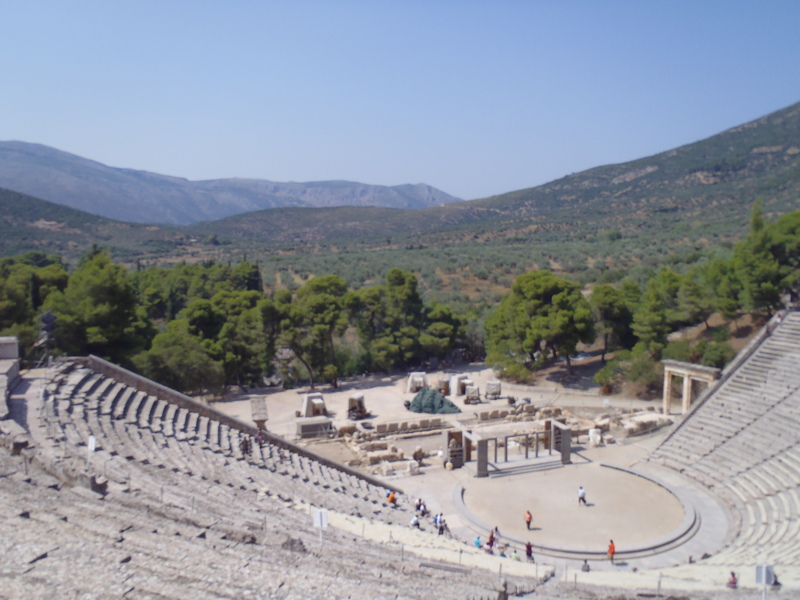 One of the few places I insisted on visiting while In Greece was Epidaurus. Many months earlier, a friend told me of their own time here and after hearing about the naturally incredible acoustics (you can hear a piece of paper being torn), I had to go! Even at the end of a long day visiting Corinth and Mycenae, I had a burst of energy once we arrived at Epidaurus and laid eyes on the theater. I took some photos from the bottom, then climbed all the way to very top row of seats. What a view – gray stone set against a backdrop of green trees, blue sky, rolling hills and mountains… breathtaking. At one point a lady took to centre stage and sang a beautiful song. Only then was I truly convinced that this theater was special. I could hear her tune from the very top row, without the aid of electronics. Someday I would like to return to Epidaurus and enjoy a live show.